A new species of Hypoderma (Ascomycota) from Italy. Lantieri A. 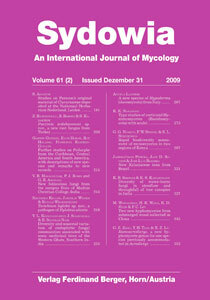 (2009) A new species of Hypoderma (Ascomycota) from Italy. Hypoderma ferulae sp. nov., collected on remnants of Ferula communis L. (Apiaceae) in central Siciliy is described, illustrated and discusses. Keywords: Leotiomycetes, Rhytismataceae, taxonomy, Sicily.